Roman gives us Fontanini Nativity figures, ornaments, and accessories. These figures are the Classic Jesus, Mary, and Joseph. Item #72811, 72812, & 72813. This is a great set for Christmas. This set of figures fits in the "7.5in" Fontanini series. We will sell the individual boxed figures as sets at the set price. We have extra Mary and Joseph but not Jesus. Fontanini 7.5 figures are often the same design as the 5 series. We dont give exact measurements for each figure but they are referred to by their size relationship to the standing. Which is approximately 7.5 tall, thus the 7.5series. Whether they are standing or kneeling, man, woman, or child, they are the appropriate size for the series. This is the same for all of the Fontanini sizes. Fontanini was founded in 1908 and has produced many figures of saints, and figures from Christ's Life. The Nativity figures come in many sizes. In prior years, as small as 1in. Up to almost life size. Usually in ornaments or scenes, 5in. & 7.5in (most popular for home because of the sizes), 12in. And 50+in for large gathering places Church, halls, etc. They also have sets which include stables. Wedding "starter" sets and "first Nativity" sets for children are also available. There is a huge selection of towns people and buildings, along with Kings, Shepherds, Angels, and assorted animals to add to sets each year. Our business, A Little Bit of Christmas, Inc. Is located in Roswell, GA USA. We have been happily serving our customers since 1995. 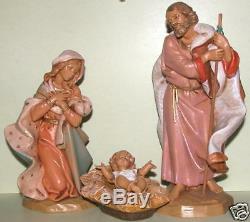 The item "Fontanini Nativity, Holy Family set 7.5in. Christmas" is in sale since Thursday, December 4, 2014. This item is in the category "Collectibles\Decorative Collectibles\Decorative Collectible Brands\Roman\Fontanini". The seller is "mrsklauze" and is located in Roswell, Georgia. This item can be shipped worldwide.